In Motive, rigid body assets are created from retroreflective markers that are attached to tracked objects. From these assets, position and orientation (6 degrees of freedom) can be obtained. This page details instructions on how to create the rigid bodies and other useful features associated with the assets. A RigidBody in Motive is a collection of three or more markers on an object that are interconnected to each other with an assumption that the tracked object is undeformable. More specifically, it assumes that the spatial relationship among the attached markers remains unchanged and the marker-to-marker distance does not deviate beyond the allowable deflection tolerance defined under the corresponding rigid body properties. Otherwise, involved markers may become unlabeled. Cover any reflective surfaces on the rigid body with non-reflective materials, and attach the markers on the exterior of the rigid body where cameras can easily capture them. Tip: If you wish to get more accurate 3D orientation data (pitch, roll, and yaw) of a rigid body, it is beneficial to spread markers as far as you can within the same rigid body. By placing the markers this way, any slight deviation in the orientation will be reflected from small changes in the position. 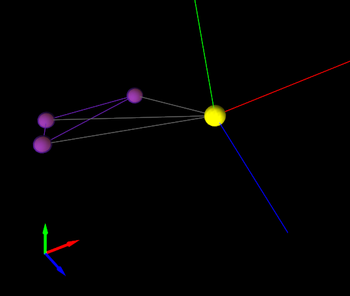 In a 3D space, a minimum of three coordinates is required for defining a plane using vector relationships; likewise, at least three markers are required to define a rigid body in Motive. Whenever possible, it is best to use 4+ markers to create a rigid body. 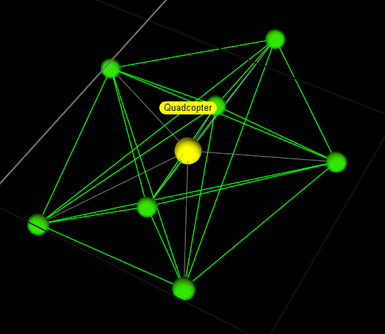 Additional markers provide more 3D coordinates for computing positions and orientations of a rigid body, making overall tracking more stable and less vulnerable to marker occlusions. When any of markers are occluded, Motive can reference to other visible markers to solve for the missing data and compute position and orientation of the rigid body. However, placing too many markers on one rigid body is not recommended. When too many markers are placed in close vicinity, markers may overlap on the camera view, and Motive may not resolve individual reflections. This may increase the likelihood of label-swaps during capture. Securely place a sufficient number of markers (usually less than 10) just enough to cover the main frame of the rigid body. Tip: The recommended number of markers per a rigid body is 4 ~ 12 markers. Rigid body cannot be created with more than 20 markers in Motive. Within a rigid body asset, its markers should be placed asymmetrically because this provides a clear distinction of orientations. Avoid placing the markers in symmetrical shapes such as squares, isosceles, or equilateral triangles. Symmetrical arrangements make asset identification difficult, and they may cause the rigid body assets to flip during capture. When tracking multiple objects, it is beneficial to create unique rigid body assets in Motive. Specifically, you need to place retroreflective markers in a distinctive arrangement between each object, and it will allow Motive to more clearly identify the markers on each rigid body throughout capture. In other words, their unique, non-congruent, arrangements work as distinctive identification flags among multiple assets in Motive. This not only reduces processing loads for the rigid body solver, but it also improves the tracking stability. Not having unique rigid bodies could lead to labeling errors especially when tracking several assets with similar size and shape. What Makes Rigid Bodies Unique? The key idea of creating unique rigid body is to avoid geometrical congruency within multiple rigid bodies in Motive. Unique Marker Arrangement. Each rigid body must have a unique, non-congruent, marker placement creating a unique shape when the markers are interconnected. Unique Marker-to-Marker Distances. When tracking several objects, introducing unique shapes could be difficult. Another solution is to vary Marker-to-marker distances. This will create similar shapes with varying sizes, and make them distinctive from the others. Unique Marker Counts Adding extra markers is another method of introducing the uniqueness. Extra markers will not only make the rigid bodies more distinctive, but they will also provide more options for varying the arrangements to avoid the congruency. What Happens When Rigid Bodies Are Not Unique? Having multiple non-unique rigid bodies may lead to mislabeling errors. However, in Motive, non-unique rigid bodies can also be tracked fairly well as long as the non-unique rigid bodies are continuously tracked throughout capture. Motive can refer to the trajectory history to identify and associate corresponding rigid bodies within different frames. In order to track non-unique rigid bodies, you must make sure the Properties → General Settings → Unique setting in Rigid Body Properties of the assets are set to False. 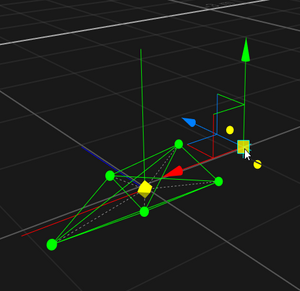 Even though it is possible to track non-unique rigid bodies, it is strongly recommended to make each asset unique. Tracking of multiple congruent rigid bodies could be lost during capture either by occlusion or by stepping outside of the capture volume. Also, when two non-unique rigid bodies are positioned in vicinity and overlap in the scene, their marker labels may get swapped. If this happens, additional efforts will be required for correcting the labels in post-processing of the data. Depending on the object, there could be limitations on marker placements and number of variations of unique placements that could be achieved. The following list provides sample methods for varying unique arrangements when tracking multiple rigid bodies. 1. Create Distinctive 2D Arrangements. Create distinctive, non-congruent, marker arrangements as the starting point for producing multiple variations, as shown in the examples above. 2. Vary heights. Use marker bases or posts, with different heights to introduce variations in elevation to create additional unique arrangments. 3. Vary Maximum Marker to Marker Distance. Increase or decrease the overall size of the marker arrangements. 4. Add Two (or more) Markers Lastly, if an additional variation is needed, add extra markers to introduce the uniqueness. We recommended adding at least two extra markers in case any of them is occluded. If you are using OptiTrack active markers for tracking, multiple rigid bodies do not need to have unique marker placements. 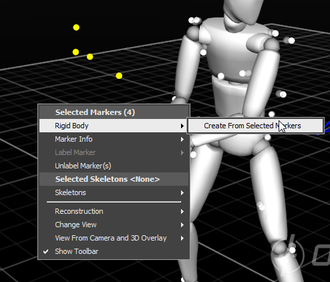 Through the active labeling protocol, active markers are labeled individually and multiple rigid bodies can be distinguished through uniquely assigned marker labels. Please read through Active Marker Tracking page for more information. Creating a rigid body from the Assets pane. Properties for the selected asset is described on the Properties pane. A set of markers attached to a rigid object can be grouped and auto-labeled as a rigid body. 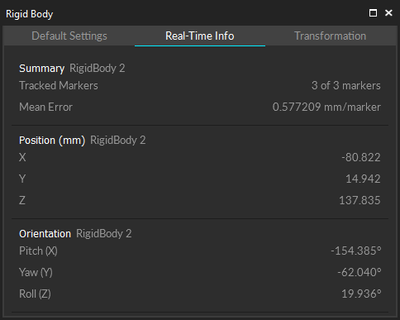 This rigid body definition can be utilized in multiple takes to continuously auto-label the same rigid body markers. Motive recognizes the unique spatial relationship in the marker arrangement and automatically labels each marker to track the rigid body. At least three coordinates are required to define a plane in 3D space, and therefore, a minimum of three markers are essential for creating a rigid body. Step 1. Select all associated rigid body markers in the 3D view pane. From Prespective View: While the markers are selected, right-click on the perspective view to access the context menu. 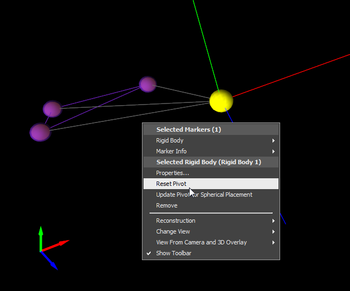 Under the Rigid Body section, click Create From Selected Markers. Assets pane: While the markers are selected in Motive, click on the add button in the Assets pane. Hotkey: While the markers are selected, use the create rigid body hotkey (Default: Ctrl +T). Step 3. Once the rigid body is created, the markers will be colored (labeled) and interconnected to each other. The newly created rigid body will be listed under the Assets pane. 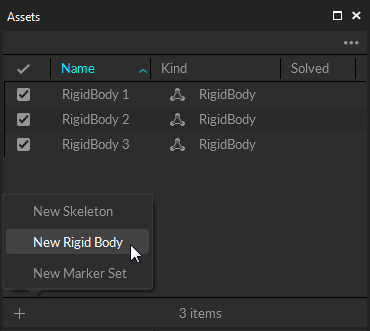 If the rigid bodies, or skeletons, are created in the Edit mode, the corresponding Take needs to be auto-labeled. Only then, the rigid body markers will be labeled using the rigid body asset and positions and orientations will be computed for each frame. Rigid body properties consist of various configurations of rigid body assets in Motive, and they determine how rigid bodies are tracked and displayed in Motive. For more information on each property, read through the Properties: Rigid Body page. When a rigid body is first created, default rigid body properties are applied to the newly created assets. The default properties are configured under the Default Settings tab in the Rigid Body pane or under the Application Settings. Properties for existing rigid body assets can be modified from the Properties pane. Properties of a selected rigid body under the Properties pane. An existing rigid body can be modified by adding or removing markers. First select a rigid body from the Assets pane or by selecting the pivot point in the Perspective View. Ctrl + left-click the markers that you wish to add/remove. Left-click on the Perspective View pane to open the rigid body context menu. 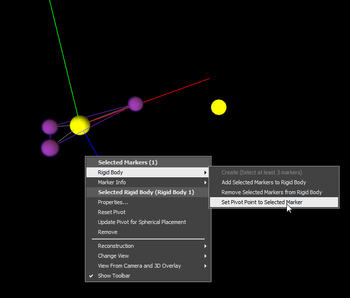 Under Rigid Body, choose Add/Remove selected markers to/from rigid body. If needed, right-click on the rigid body and select Reset Pivot to relocate the pivot point to the new center. Adding an extra marker to an existing rigid body asset. The pivot point of a rigid body is used to define both position and orientation. When a rigid body is created, its pivot point is be placed at its geometric center by default, and its orientation axis will be aligned with the global coordinate axis. To view the pivot point and the orientation in the 3D viewport, set the Pivot and Orientation to true under the display settings of a selected rigid body in the Properties pane. Rigid body real-time information. The position is represented in respect to the global origin, and the orientation is represented in respect to the initial orientation when the rigid body was created. Position and orientation of a tracked rigid body can be monitored in real-time from the Rigid Body pane. First, select a rigid body in Motive, and in the Rigid Body pane, access the real-time info tab where the tracking information of selected rigid body is displayed. As mentioned previously, the orientation axis of a rigid body, by default, gets aligned with the global axis when the rigid body was first created. After a rigid body is created, its orientation can be adjusted using the Transformation tab under the Rigid Body pane. To reset the orientation, first physically orient the tracked object in the desired orientation with respect to the global coordinate system, select the corresponding rigid body in Motive, and press Reset under the orientation section of the transformation tab in the Rigid Body pane. Then, the coordinate axis of the rigid body will be zeroed to the orientation. Precise adjustments can also be made by manually entering pitch, roll, and yaw values to reorient the rigid body coordinate axis. This can also be done by editing the rigid body definition using the GIZMO tool. There are situations where the desired pivot point location is not at the center of a rigid body. The location of a pivot point can be adjusted by assigning it to a marker or by translating along the rigid body axis (x,y,z). For most accurate pivot point location, attach a marker on the desired pivot location, set the pivot point to the marker, and apply the translation for precise adjustments. If you are adjusting the pivot point after the capture, in the Edit mode, the Take will need to be auto-labeled again to apply the changes. Using the gizmo tool to adjust pivot orientation. Read through the Gizmo tools page for detailed information. To assign the pivot point to a marker, first select the pivot point in the Perspective View pane, and CTRL select the marker that you wish to assign to. 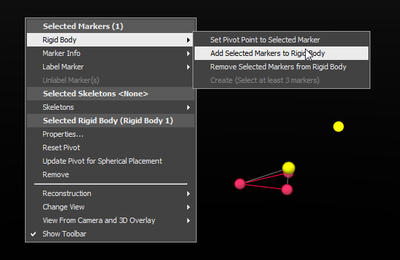 Then right-click to open the context menu, and in the rigid body section, click Set Pivot Point to Selected Marker. 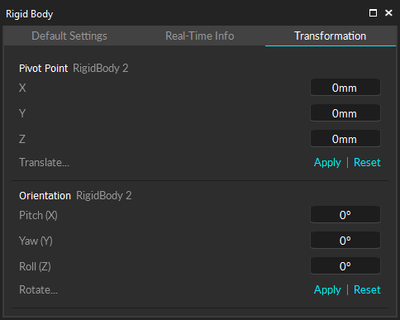 To translate the pivot point, access the Transformation tab in the Rigid Body pane while the rigid body is selected. Then, on the Pivot-Point Translation section, insert the amount of translation (in mm) that you wish to apply. Note that the translation will be applied along the x/y/z of the rigid body orientation axis. Resetting the pivot point will position the pivot point at the geometric center of the rigid body according to its markers. 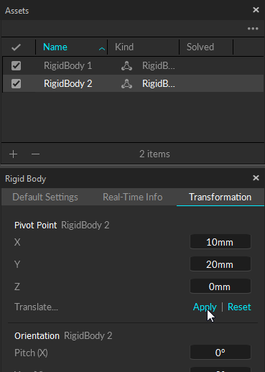 If you wish to reset the pivot point, simply open the rigid body context menu in the Perspective pane and click Reset Pivot. 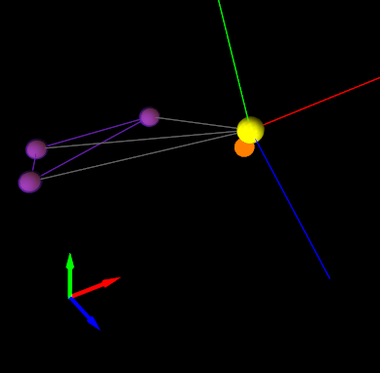 The location of the pivot point will be reset back to the center of the rigid body again. 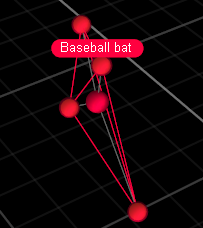 This feature is useful when tracking a spherical object (e.g. ball). The Update Pivot for Spherical Placement feature will assume that all the rigid body markers are placed on the surface of a spherical object, and the pivot point will be calculated and re-positioned accordingly. To do this, select a rigid body, right-click to access the context menu, and click Update Pivot for Spherical Placement. Rigid body refinement tool improves the accuracy of rigid body calculation in Motive. When a rigid body asset is initially created, Motive references only a single frame for defining the rigid body definition. The rigid body refinement tool allows Motive to collect additional samples in the live mode for achieving more accurate tracking results. More specifically, this feature improves the calculation of expected marker locations of the rigid body as well as position and orientation of the rigid body itself. This feature is supported in Live Mode only. Under Tools tab open the Trackables pane. In Live mode, select an existing rigid body asset that you wish to refine. Hold the selected rigid body at the center of the capture volume so that as many cameras as possible can clearly capture the markers on the rigid body. Under the Refine Samples entry, Set the number of sample frame that you wish to capture for the refining process. 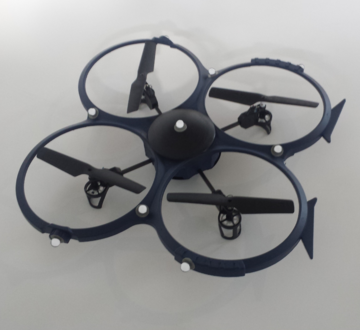 Slowly rotate the rigid body to collect samples ranging rigid body orientations. Once all necessary samples are collected, the refinement results will be displayed. This page was last modified on 1 March 2019, at 20:22.